Berberine is used to lower blood sugar, lower triglycerides and cholesterol, correct insulin resistance, and is remarkably useful as a weight loss supplement. Improving insulin resistance has been demonstrated to reduce the risk of cancer, and to improve survival rates in many types of cancer. 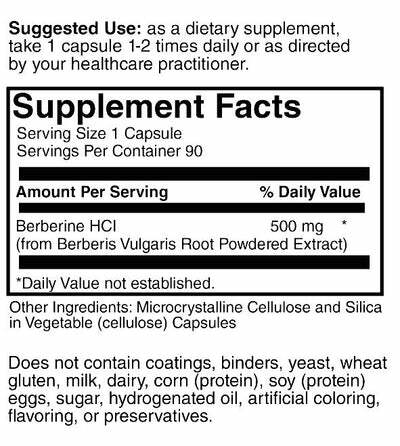 Berberine is a quaternary ammonium salt from the protoberberine group of isoquinoline alkaloids, found in such plants as Berberis [e.g. Berberis aquifolium (Oregon grape). Berberine has various beneficial effects on the cardiovascular system and significant anti-inflammatory activities, reducing intracellular superoxide levels in LPS-stimulated macrophages. Such a restoration of cellular redox by berberine is mediated by its selective inhibition of gp91phox expression and enhancement of SOD activity. Berberine has been shown to lower elevated blood glucose as effectively as metformin. The mechanisms of action include inhibition of aldose reductase, inducing glycolysis, preventing insulin resistance through increasing insulin receptor expression and acting like incretins. Data suggests that berberine may overcome insulin resistance via modulating key molecules in insulin signaling pathway, leading to increased glucose uptake in insulin-resistant cells. Berberine lowers elevated blood total cholesterol, LDL cholesterol, triglycerides and atherogenic apolipoproteins (apo B) (Apo B), but the mechanism of action is distinct from statins. Berberine reduces LDL cholesterol by upregulating LDLR mRNA expression post-transcriptionally while downregulating the transcription of proprotein convertase subtilisin/kexin type 9 (PCSK9), a natural inhibitor of LDL receptor (LDLR), and increasing in the liver the expression of LDL receptors through extracellular signal-regulated kinase (ERK) signaling pathway, while statins inhibit cholesterol synthesis in the liver by blocking HMG-CoA-reductase.